Every year at Halloween well-meaning parents dress their children in grotesque and ghoulish costumes, and it was no different this year. 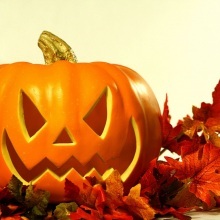 Many Australians celebrate Halloween which occurs annually on October 31. Halloween is an observance that is becoming a growing trend in Australia. Costume parties are held and many children go trick-or-treating around this time of the year. Some businesses and organizations coordinate Halloween-themed gatherings for staff and clients to interact with each other. Charity organizations even may have fundraising activities that centre on the Halloween theme. But is Halloween really harmless? Who and what's behind this bizarre holiday? It all looks like so much fun and seems so harmless: jack-o'-lanterns, grotesque grinning masks, long black witch attire with pointed black hats, costumes painted like skeletons, outfits that represent demons and goblins, and children going door to door, soliciting treats from compliant neighbors. Is Halloween simply good, clean fun, or is it something else entirely? You need to know! Just where did Halloween come from, and why is it so widely celebrated? The Encyclopedia of Religion explains: "Halloween is the name for the eve of Samhain, a celebration marking the beginning of winter as well as the first day of the New Year within the ancient Celtic culture of the British Isles. The time of Samhain consisted of the eve of the feast and the day itself (31 October and 1 November)." "On this occasion, it was believed that a gathering of supernatural forces occurred as during no other period of the year. The eve and day of Samhain were characterized as a time when the barriers between the human and supernatural worlds were broken. Otherworldly entities, such as the souls of the dead, were able to visit earthly inhabitants, and humans could take the opportunity to penetrate the domains of the gods and supernatural creatures." Halloween is a day devoted to appeasing demonic spirits and the dark side of the spirit world -- something in which no Christian should have any part. Ephesians 5:11 says: "And have no fellowship with the unfruitful works of darkness, but rather reprove them." So how did this dark celebration continue into modern times? Halloween came down to us from the Roman Catholic Church which assigned a day of each year to each of their saints. When it reached the point that they had more than 365, they then combined them together on Nov. 1 and called it "All Saints Day" or "All Hallows Day" -- the night before being "All Hallows Eve" or "Hallow Even" (holy evening), contracted to the name Hallowe'en or Halloween. Why did they choose this particular day? Again The Encyclopedia of Religion explains: "Samhain remained a popular festival among the Celtic people throughout the christianization of Great Britain. The British church attempted to divert this interest in pagan customs by adding a Christian celebration to the calendar on the same date as Samhain. The Christian festival, the Feast of All Saints, commemorates the known and unknown saints of the Christian religion just as Samhain had acknowledged and paid tribute to the Celtic deities" (p. 177). Thus a pagan celebration was relabeled as Christian. You cannot find any support for Halloween in your Bible. God is actually adamantly opposed to it and the pagan, occult practices it revels in. 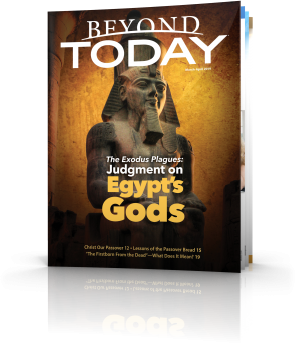 He warns His people to have nothing to do with these (Leviticus 19:31; Deuteronomy 18:10-12). God does not take Halloween lightly. As He says, "Learn not the way of the heathen" (Jeremiah 10:2 King James Version). 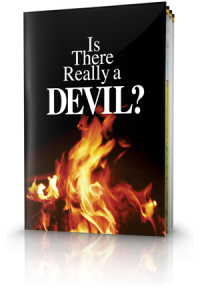 God is giving a wake-up call to professing Christians. As it was with those the prophet Elijah addressed in his day, so it is with us: "'How long will you falter between two opinions? If the Lord is God, follow Him; but if Baal, follow him.' But the people answered him not a word" (I Kings 18:21). God will not always remain tirelessly patient with those who insist on celebrating harmful and superstitious customs such as Halloween. "The Lord is not slow in keeping his promise, as some understand slowness. He is patient with you, not wanting anyone to perish, but everyone to come to repentance . . . What kind of people ought you to be? 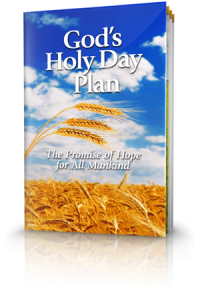 You ought to live holy and godly lives as you look forward to the day of God" (2 Peter 3:9-12 NIV). 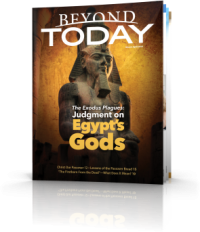 Now that we can see beyond Halloween's fun-like facade and understand God's perspective, let's say an emphatic 'NO!' to all things to do with Halloween when it comes around next year. As Christians we must stand for God's truth rather than harmful traditions that originated in paganism? 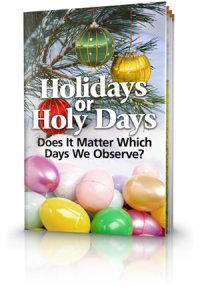 Or find the link below to one of our free bible study aids -- Holidays or Holy Days: Does It Matter Which Days We Observe?